So, I’ve never been a diligent, or good boulderer. I just don’t get it. Well I do, it just doesn’t float my boat…particularly. I understand the training benefits from a broader climbing perspective, the overall ‘challenge’ of it and to be frank, I am struggling to recall the last time I went. we are talking years! Its something to do I think with people standing around, posing, tops off and watching… I think! So why today then? Well a mate had suggested checking The Depot out, a posh new wall in Manchester a few weeks ago. I had read some press, seen some reviews it all sounded very positive, so said yes, lets do it. However he then cried off sick, so I went for a long run instead. Skip to the present and I thought, I have a few hours, why not head to The Depot. So I did. So I started at the bottom (V0-V1) and thought I’ll bash through them all and then go on to some V1 to V2’s and maybe a comp line. there were loads! To be honest I lost count, but comfortably over a dozen – that is a good number for beginner lines and despite my discomfort “bouldering” (be assured my top was on and staying there) I was enjoying the fact that I had been there 45 minutes and wasn’t bored yet having blasted through the easy stuff and getting spanked on the moderate grades! I had a go at a few comp lines – I got to the third problem and two blues, before grabbing some food (kind of pricey, £1.50 for a coffee £3.90 for a pannini -but nice). Feeling replenished and rested I went back to the white circuit and went again… but by the 6th or 7th line I was feeling it in the arms so decided with a big race tomorrow I didn’t want to injure myself or stretch too far, so time to retreat. So for £5 membership for the year – I will be back. 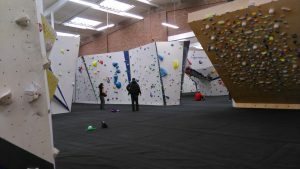 It looks like they change routes regularly, host other events (a film screening coming up, the comp the weekend previous, do parties etc) and run ‘Yoga for climbers’ sessions. Location wise if you are Manchester based or west/south of Manchester, then its a no brainer. For me, with the road works on the motorway (and okay the weather didn’t help) it took me three and a half hours to get there and back… I was expecting two!